It's not too early to start thinking about fresh peaches. Actually, some of the California peaches are in the supermarkets already; however, their quality is somewhat uneven, what with being picked early and shipped for hundreds or thousands of miles. Still, even now it is possible to find ripe peaches with good flavor. In a manner of weeks, however, local peaches all over the country will begin ripening and crowding the shelves of produce departments and farmers markets everywhere. There's something about peaches -- maybe it's the velvety skin -- that makes them seem so impossibly delectable. A ripe peach when bitten into has a tender "give" to it, followed by a rush of incredibly sweet and flavorful juice that is about as close to being decadent, without being chocolate, as you can get. We owe it to ourselves, then, to experience peaches during their summer prime in as many ways as possible. 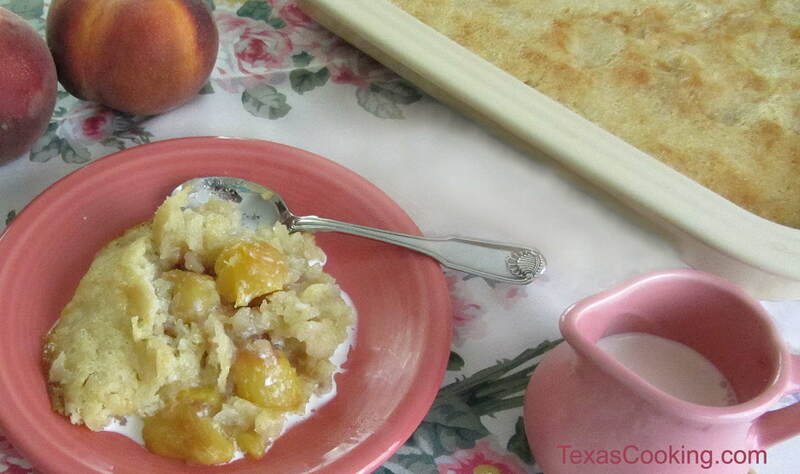 And one of the best, most time-honored ways to enjoy peaches is in a peach cobbler. So what exactly is a cobbler? Well, it's not a pie, and it's not a pudding. In fact, some people differ significantly on just what a cobbler should be. The following are two Peach Cobbler recipes that are quite different from each other, but are equally delicious. Since, as far as I'm concerned, each has the right to be called Peach Cobbler, I will differentiate between the two by naming one Grandma's Peach Cobbler and the other Old Fashioned Peach Cobbler (although Grandma made both). The Old Fashioned Peach Cobbler uses a double-crust pastry, just like you make for a pie, but the pastry is not used, as pie pastry is, to line the pan. The other cobbler, Grandma's Peach Cobbler, is surprisingly quick to put together and, again, probably unlike anything you have ever baked. Both cobblers are frequently served warm with a scoop of vanilla ice cream. Roll out half the pastry as for a pie, but cut it into an 8-inch square. Spoon half the peach mixture into a lightly buttered 8-inch square Pyrex dish. Cover with the pastry square. Bake for 12 to 14 minutes, or until lightly browned. Remove from oven and spoon remaining peach mixture over the baked pastry. Roll out the remaining pastry, and cut into strips about an inch wide. Arrange strips in a loose lattice weave over the peach mixture. Sprinkle lightly with granulated sugar, if desired. Bake an additional 15 to 20 minutes or until browned. Put the butter in a 9x13-inch Pyrex baking dish and put the dish in the preheating oven. While the butter is melting, mix up the batter by combining the flour, baking powder, salt, sugar and milk. When the butter is completely melted, remove the pan and pour the batter into the melted butter. Then, carefully spoon the peaches and juice evenly over the batter. Return dish to the oven and bake for 30 minutes. As the cobbler cooks, the batter will rise up and around the peaches. Makes 10 to 12 servings. Cobblers require ripe peaches of the highest quality. If you can't find really excellent fruit, I would forget about trying to make the Old Fashioned Peach Cobbler; however, a satisfactory Grandma's Peach Cobbler can be made with frozen peaches to which no sugar has been added. These are available at most any supermarket. Personally, I think each of these dishes is wonderful. Peaches are so good, we should devote our ingenuity to inventing culinary uses for them. But you decide. I think you'll come down in favor of both these wonderful desserts.